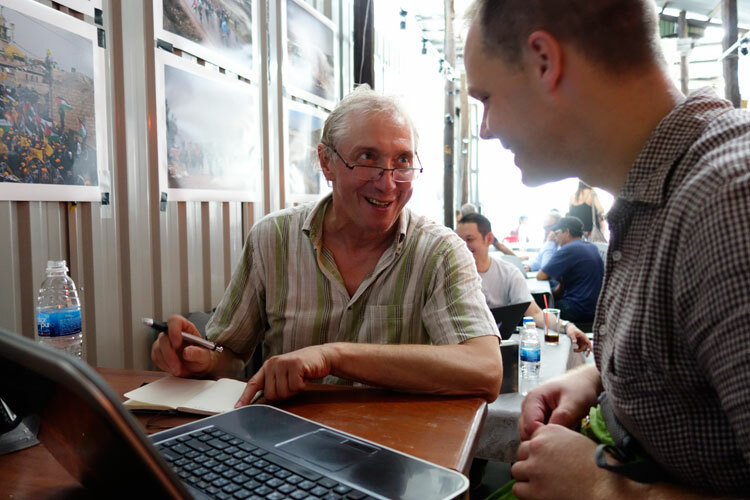 Keep your eyes peeled for another series of free portfolio reviews during the 10th Angkor Photo Festival! The 2014 reviews are open to all attending photographers, and we are privileged to have professional photographers volunteer their time and expertise to be part of our reviewers panel. To sign up for the reviews, look out for the sign-up sheet at the Festival and Workshop Center! Our selected list of 2014 Portfolio Reviewers is below. Born in Paris, Patrick Chauvel is a veteran of more than 20 conflicts, beginning with the 6-Day war in 1967 and Vietnam in late 1960’s. Although he remains committed to working in still photography, he started producing and directing documentary in 1996, with such subjects as the struggles in Chechnya and Palestine. Julia is a senior cultural producer in the Auckland region, who has worked in the creative industries for over 2 decades. She is a founding member of the Auckland Festival of Photography and Asia Pacific Photoforum. Elaine is in charge of Talking Culture, Commissions and Projects at Auckland Festival of Photography. Vincent is a French photographer who works in many genres of commercial photography, music, advertising and editorial. His current work focuses on the New York Jazz scene. Vincent Marco is an independent photography professional, in charge of exhibitions for Noordelicht Photo Festival in Groningen, Netherlands. 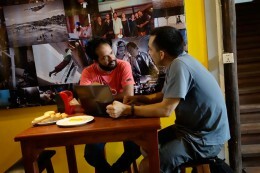 Photographer Vignes is the founder and director of Obscura festival in Penang, Malaysia. Chemat, is a lecturer for Photography in the Faculty of Creative Multimedia (FCM), Multimedia University (MMU), Selangor, Malaysia, and is also one of Malaysia’s leading figures in Street Photography. Will was long-time Photo Editor at The Phnom Penh Post, and got his start as Photographer for Reuters in Southeast Asia. 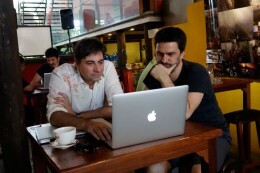 He has extensive experience in the field covering conflicts and humanitarian issues, and is currently based in Bangkok. John is a professional photographer and Head of Photography at Greenpeace International, Amsterdam. Grace is Regional Images Officer for Greenpeace Southeast Asia based in Manila. Her work covers the whole Southeast Asia. Julien has worked as the International Photo Editor at Newsweek, Editorial Director of Magnum Paris, Photographer for The New York Times and World News Photo Editor for The Wall Street Journal. Julien has also worked as an in-­house concert photographer for Carnegie Hall since 2008 and is a founding member of Fovea, a company and gallery space that exhibits many of the world’s photojournalists at their space in Beacon, NY. He is the co-founder of Blink, a new networking platform connecting photographers and editors around the world. Jeff Moorfoot is a photographer and the founder of the free radicals, co-organiser of the Homeless Gallery / Galeria Bezdomna in Australia, Former Vice President of the Victorian Division of the AIPP, and Festival Director of the Ballarat International Foto Biennale. Born in Afghanistan, Swiss-based photographer Zalmaï has worked for a number of International Organizations and NGOs, including Human Rights Watch, International Committee of the Red Cross, UN Office On Drug and Crime, and the UN Refugee Agency. Sandra is a freelance photojournalist who works for magazines, NGOs and on her personal projects concentrating on social and human rights issues. She is represented by Laif, agency for photos and reports. Patrick Brown is the recipient of the 3P Photographer Award, World Press Award, Days Japan Award, Picture Of The Year Award, New York Photographic Book Award and NPPA’s Best of Photojournalism Award for his work. 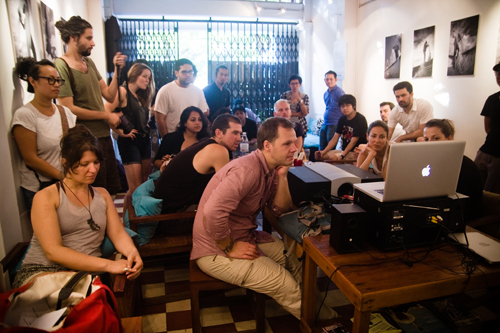 Initiated by photographers, our Artist Sharing Sessions and Afternoon Panel Discussions have grown from year to year! We look forward to yet another series, which are free and open to all attending visitors. 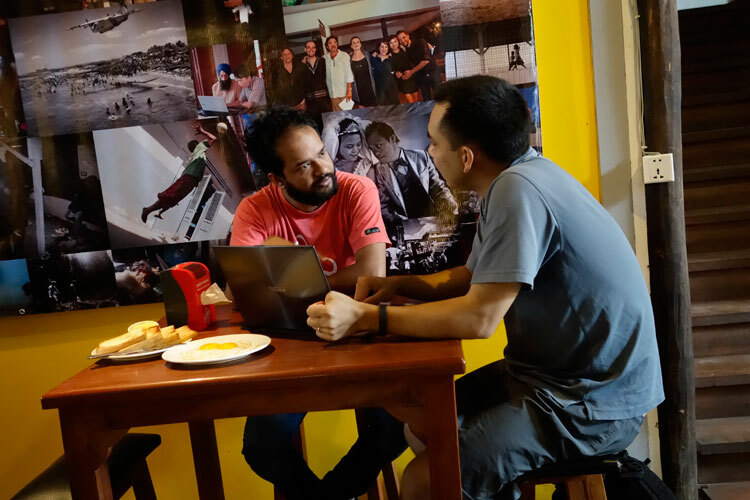 Designed as an informal and casual platform, the aim of these sessions are to provide a space for photographers to exchange ideas, share new work, get peer feedback, and initiate discussions on topics close to their hearts. To sign up for these sessions, email us in advance to make arrangements or simply look-out for the sign-up sheet at the Festival and Workshop Center! How does the rise of startups, new technology and social media affect photographers? Will it bring more opportunities, or just more competition? Does increased connectivity come at the cost of quality work? The panel features experienced Asian and international media professionals, photographers, and startup entrepreneurs, including Julien Jourdes, co-founder Blink.la. Dec 4: (1.30pm): ‘Visualising Social Stories’ by Robert Godden, Rights Exposure Project, and Invisible Photographer Asia. This interactive presentation and discussion forum will explore the process of ensuring your photo story creates an impact on social issues. The workshop will be co-ordinated by Ying Ang, Sean Lee and Bella Capezio, and is limited to 12 participants on a first-come first served basis. 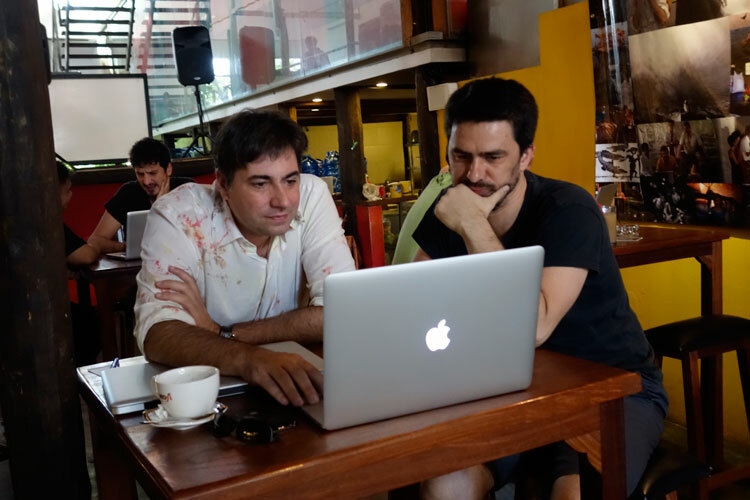 The workshop is free but we are asking for donations of US$10-50 from participants to cover some of the costs – if you can’t pay you don’t have to. Please email [email protected] ASAP to book your spot. 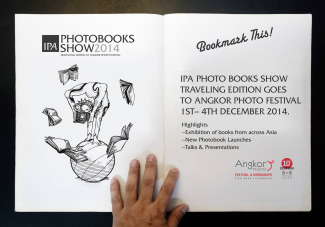 The 2014 Angkor Festival-Asia-Pacific Photobook Archive Workshop is designed for photographers who are interested in developing a concept, edit and sequence for a book. Ideally for projects that are close to completion or at least well advanced. All the photographers will be expected to participate in pushing each other creatively and conceptually in discussing ways to problem solve the medium shift between singular images to the book as an object in the current environment of photography. The first part of the workshop will feature an intimate look at several publications, followed by a discussion on what makes them successful and the process involved in making them possible. There will then be an advanced critique led by Ying Ang and Sean Lee, who are both launching their first major monographs at the Angkor Photo Festival on December 1. A series of prints A5 or A4 – 50+ prints is suggested, they can be printed on low quality paper. Work only on screen will not be suitable for this workshop – as sequencing, flow and narrative are the focus participants MUST bring prints. The workshop will end with a roundtable discussion on self-publishing vs. outsourced publishing, and how to get things done. Based between Melbourne, Singapore and New York, Ying Ang is a photographer of social and contemporary issues. Her interests lie in creating visual and literary content for print, web and installation, exploring a range of formats and styles. Ying has exhibited internationally in group and solo shows from New York to Arles, in addition to working for clients such as the Wall Street Journal, The Fader in New York, Das Magazine in Zurich, Yo Dona in Madrid and Afisha Mir in Moscow on editorial features. She graduated as valedictorian for the 2009-2010 class of Documentary Photography and Photojournalism at The International Centre of Photography, has garnered a wide range of international awards and was a participant in the Reflexions Masterclass of 2011-2013. Sean Lee was born in 1985 and grew up in Singapore. His first body of work was Shauna, made between 2007 and 2009. This work was nominated for the Prix Découverte on the 40th anniversary of Arles Photography Festival. Since then, Sean has gone on to make other stories. His most recent work, Two People, received the 2011 ICON de Martell Cordon Bleu award. Sean’s work can be found in the collection of the Singapore Art Museum, as well as in the Sandor Family Collection. Based in Melbourne, Isabella is a part of the Asia-Pacific Photobook Archive team. She is a graduate of RMIT University. She is currently completing postgraduate studies at RMIT. Isabella’s personal work is often inspired by her awareness of society’s incongruities, and is permeated by an understanding and appreciation of the differences she experiences throughout her encounters with people and environments. She has self-published a number of photobooks addressing themes of religion, community, and the morality of culture. Based in Melbourne, Bella Capezio is a part of the Asia-Pacific Photobook Archive team. She is a graduate of RMIT University.